Mise-en-scène is an improbable balloon dispenser that takes over as the centre of the action, involving and summoning passers-by. Introducing an amorphous plastic inflated skin, the piece is to be undressed by the removal of the multiple balloons, progressively revealing the perforated sheet metal structure that gives it shape. The participated transformation of an opaque and misshapen architectural installation into a contrasting object of overlapping rigid but visually permeable planes occurs from the collection of the balloons from the multiple holes of the structuring epidermis. At the same time, there is the dissemination of the small installation through the public space, spreading a stain of colour throughout the city, which provoques the physical limits of the intervention. Designed for Festa, a festival of performing arts in Ovar, Portugal, Mise-en-scène is formalized by the confluence of three staircases with four steps, arranged in different directions, into a single elevated point, creating a small balcony raised over the city. 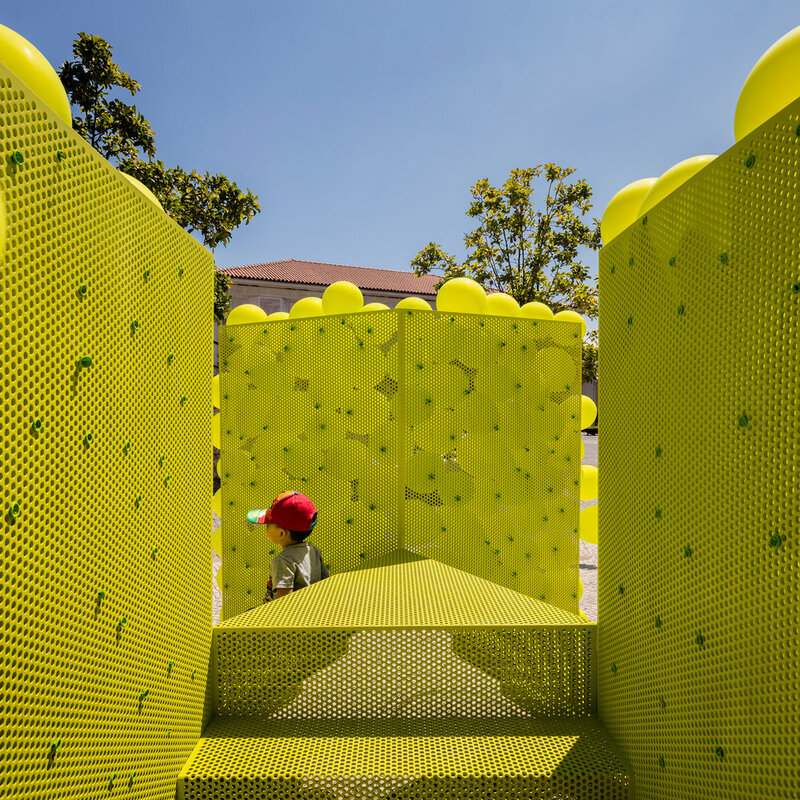 Presenting a strong scenographic profile, the mutable architectural piece was appropriate as a bench, pulpit, belvedere, meeting point, or even, as a privileged stage for the street performances.